Just wrap our Treegator® Original around a tree, zip the two sides together, and fill it with water - that's it! Place back of bag against trunk, with zippers on the uphill side of tree. Use a Single Bag setup for trees from 1 to 3 inches in trunk diameter (caliper). Use a Double Bag setup for trees from 4 to 8 inches in trunk diamter (caliper). Zip both sides of bag together from bottom to top. Lift up tag at top of bag to expose fill opening. Insert water hose (up to 3 inch diameter), into fill opening, turn on water supply and begin filling. Note: Fill bag only to approximately 1/4 capacity, then proceed to Step 3 below. If desired, add pre-mixed water soluble fertilizer and/or nutrients. 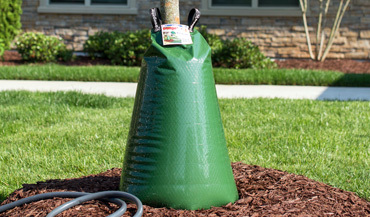 Fill Treegator® Original bag with water to desired level and let drain. Treegator® Original will be empty in approximately 5 to 9 hours. Once empty, remove bag from tree , move to another planting and re-fill, or store until needed again. Use Treegator® Original on small as well as large established trees. Water trees up to 8 inches in trunk diameter (caliper) just by zipping two Treegator® Originals together back-to-back. Do not suspend or hang bag from black straps / handles. Never lift bag by 1 handle / strap - Always use both handles when lifting. Do not unzip or transport bag when full. Do not tear / rip fill opening. Do not zip together more than 2 Treegator® Original bags. Product is not a toy. Keep away from small children. Every Treegator® Original is backed by a 5 year limited manufacturer warranty from the original date of purchase, against any defects in materials and/or workmanship. • Recommendations are based on a commonly referenced guideline of 10 gallons of water applied per 1 inch of tree trunk diameter (caliper)*.